Serve up a seasonal bounty on the Late Harvest Cheese Board, made from natural bamboo with a food-sa..
With HOST's variable aeration, perfectly aerate anything from your lightest Pinot Noir to your m..
inturi Red Wine Aerator and Tower Set (P/N V1071). 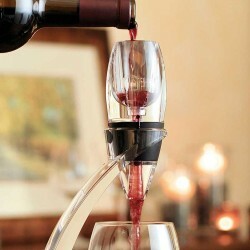 Vinturi delivers perfect aeration in the time it ..
Vinturi Red Wine Aerator Essential (P/N 6700). As wine breathes, it releases its intended aromas and..